For nine years Brother Clendennen was my Pastor, Friend and more importantly like a Father to me. I can truely say that few men in this generation have left the spiritual legacy, testimony and example which he has left behind. His humility, simplicity, love, faith, hope, zeal, energy and labour have left a permanent mark upon me and great multitudes of leaders across the world. I have no doubt that his ministry, character and conduct matched that of such men as John Wesley or Hudson Taylor. For 35 years he faithfully pastored Victory Temple in Beaumont Texas. 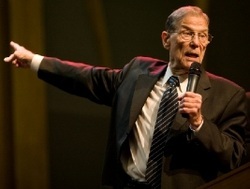 He was one of the first three preachers to broadcast on Television across America. At the age of 70 he pioneered a new work called School of Christ International which began in Russia in 1992 when he moved there with his wife to live. In the next 17 years SOC was used in God's hand to be a tool in every continent, in over 130 nations, to train up leaders and preachers. To the end he travelled, taught and preached incessantly. Since 2001 I had the great pleasure to labour by his side arranging meetings, conventions and School's in Europe. We were last with him on his last International trip in his 88th year in September 2009 when he preached the purity and simplicity of Christ Jesus with as must liberty, revelation and anointing as I had ever seen him. On that last trip he preached in Belguim and France to believers and leaders alike. To the end his desire and vision was to raise up a spiritual vessel which would reveal the glory of God to this generation. His friendship and fellowship is greatly missed.